James O’Keefe’s Breakthrough: Review & Prize Winner! The following is Neal Dewing‘s review of James O’Keefe’s book Breakthrough: Our Guerilla War to Stop Fraud and Save Democracy, originally published in the Pocket Full of Liberty newsletter. In order to give one of our subscribers the opportunity to check out the book for him or herself, we gave away a signed copy of O’Keefe’s book. And the winner is… @nicolejpearce! Congratulations, Nicole! There’s no need to mince words when it comes to James O’Keefe. Such is his notoriety that he barely needs any introduction in political circles. The man responsible for goosing ACORN and Planned Parenthood with undercover videos earned some powerful enemies right out of the gate – and has only added to the list as time goes by. To some on the Right, he’s a New Media hero; to others he is fool and a liar. Better for all our souls not to delve too deep into the things the Left says about him (hopes that he will experience a traumatic prison “romance” seem to be a common theme). With his latest effort, James O’Keefe is attempting to present a different view of his work: his own. 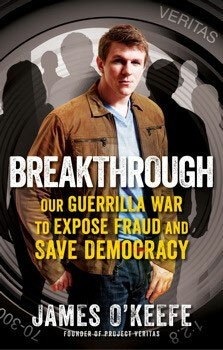 Breakthrough: Our Guerilla War to Stop Fraud and Save Democracy is Mr. O’Keefe’s first book and I have to say it surprised me. I went into it with some trepidation. I expected tedious, Internet-standard grievance-mongering; I got a nicely-paced and sometimes exciting narrative. I assumed I would read a by-the-numbers rehash of the petty squabbles which characterize much of what passes for civil discourse on Twitter; I actually read an account of citizen journalists making real contributions to the ongoing fight for accountability in government and the media. My own initial assessment of the man, back in the ACORN days, was less than glowing. While I applauded his choice of targets, I worried his methods would steal the focus away from his content. Why the silly costumes and undercover stings? If one is confident in his material, is there really a need for the theatrics? There is a sense that O’Keefe is reflexively thumbing his nose at the media world, rejecting its conventions as they would reject him. In the book, his accounts of the attempts to discredit him and marginalize his content (not to mention his legal woes) would seem to support my initial reservations about his effectiveness. But as it happens, we should be glad Mr. O’Keefe doesn’t listen to people like me very often. He takes us along for the ride on his greatest hits, revealing something of his motivations. For those of us who tend to contribute to the conservative movement by blogging every few weeks and then showing up on Election Day, it’s really a fascinating perspective. O’Keefe cites Saul Alinsky (yes, the very one you’re thinking of) as a major influence, going so far as to structure his chapters around a series of “Veritas Rules” that provide a framework for his operations and a set of guiding principles. These rules range from the practical (#18, Obsess over getting your subject in frame) to the philosophical (#27, The truth is manifestly damning). As a set of guideposts for those who’d like to follow in O’Keefe’s footsteps, they could stand to be fleshed out in a separate work. Alinsky’s name is something of an obscenity in certain circles, but the influence of his tactics, on community organizing and “guerilla journalism” alike, is undeniable. O’Keefe is extremely obnoxious – and that’s a good thing to be when you’re a journalist. In the course of his stings, O’Keefe takes risks that don’t always pay off. When his schemes go over well, the information he showcases can get results (for instance, a Voter ID law passed in New Hampshire or the defunding of ACORN). But when plans go awry, things can get pretty hairy. The best passages in the book are those related to his arrest for entering Senator Mary Landrieu’s New Orleans office under (allegedly) false pretenses. The senator claims that her phone lines were jammed, preventing constituents from reaching her office to share their views on the impending Obamacare bill. O’Keefe and crew set out to determine the veracity of this claim with an undercover investigation, but do not acquit themselves well. The scheme goes poorly and police arrest the author and his colleagues. Surrounded by federal agents on the street with guns at the ready, O’Keefe is taken into custody and his property is confiscated. Being arrested is no fun, and he communicates the tension, uncertainty, and fear that comes along with being processed. I was not about to challenge their authority. I tried to explain that I had gone to the federal building to expose corruption, to uphold the law, not to break it. My motives were patriotic, I told them. I might as well have been telling him why we parked the car on Magazine Street. My words simply did not register. His indifference was frustrating, unnerving. I could see how easy it was to break a prisoner. I was close. He’s no stalwart hero in this scene. He’s a young man who is intimidated by the manner of his arrest and detention. He experiences firsthand how easy it is for a citizen to be stripped of his freedom. He is alternately ignored and obliquely threatened. He becomes perversely grateful to his captors when they remove his handcuffs. He signs away his Miranda rights. He spills his guts before ever talking to a lawyer. And when he’s finally released, he is faced with a waiting gaggle of reporters, all-too eager to show the world that he has been brought low. It’s a well-written scene, and it’s no less effective for the comparatively minor sentence he ultimately received. When one spends his career making enemies who have the ability to damage and destroy reputations, it becomes necessary to correct misconceptions. A portion of every episode is taken up with O’Keefe setting the record straight, giving his perspective, countering the narrative… however you want to say it. It is plain that credibility is centrally important to Mr. O’Keefe and he is at pains to hit back at the mainstream media’s perception of him. Where there is so much to correct, it seems that at least some of the criticism should stick, but the author comes equipped with a never-ending supply of justifications for his decisions. Similarly, while the jailhouse scene aptly communicates the stress of being run through the penal system, O’Keefe revisits the personal inconvenience of his resulting probation a few too many times. It has the effect of taking a break from a good yarn to whine just a little. It distracts from what I felt was the actual story, though not to the overall detriment of the book. Ultimately, it’s up to the reader to decide whether the rejoinders to his critics serve to clarify or are merely self-serving. Whatever you think about O’Keefe personally, you should come away from this book with a new respect for the work that he does. Whatever his detractors say about him, he has counted coup against powerful interests. His journalism (it is indeed journalism) has inspired policy corrections, resignations, and Congressional action. I’d prefer a world where James O’Keefe didn’t need to resort to juvenile antics or undercover stings to break through the media blockade on certain issues. We don’t live in that world. I’m of the opinion that his investigations, because they are able to attract such attention and circumvent the usual media gatekeepers (and because they traffic in the truth), are indisputably essential and worthwhile. Likewise, his book is essential and worthwhile reading for anyone who would like a sharply-written, slightly manic look at what it takes to shape public opinion and influence people – when the only media you can rely on is the media you make yourself.